For consultants, GPs and other health professionals as well as families and individuals seeking to know more about Alström Syndrome. 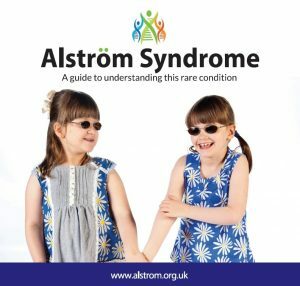 This booklet has been developed by Clinicians, family members and Alström Synd rome UK in an effort to promote greater awareness and understanding of Alström Syndrome, and to widen the spread of current knowledge. It has been kindly funded by NHS England. It is hoped that the booklet will prove useful to medical and healthcare professionals and to families and individuals who may be anxious to know more about the Syndrome and the advances in methods of treatment. This booklet uses a wide range of terms for medical conditions which may affect children and adults with Alström Syndrome. These are explained throughout the booklet and summarised in a glossary on page 25. Please note that the symptoms and conditions listed are intended to aid diagnosis and do not necessarily apply in every case of Alström Syndrome. It is important to remember that even amongst siblings the symptoms can vary. Alternatively you can email Catherine Lewis catherine.lewis@alstrom.org.uk for a copy.